How fitting that my last sleep in the US is also Super Bowl Sunday! During the delay of game, it started to hit me that the next time I sleep in a bed would be in Australia!!!!! I was seriously leaving the US. The reality of my move kind of hit me especially since the Super Bowl commercials could not hold my attention. 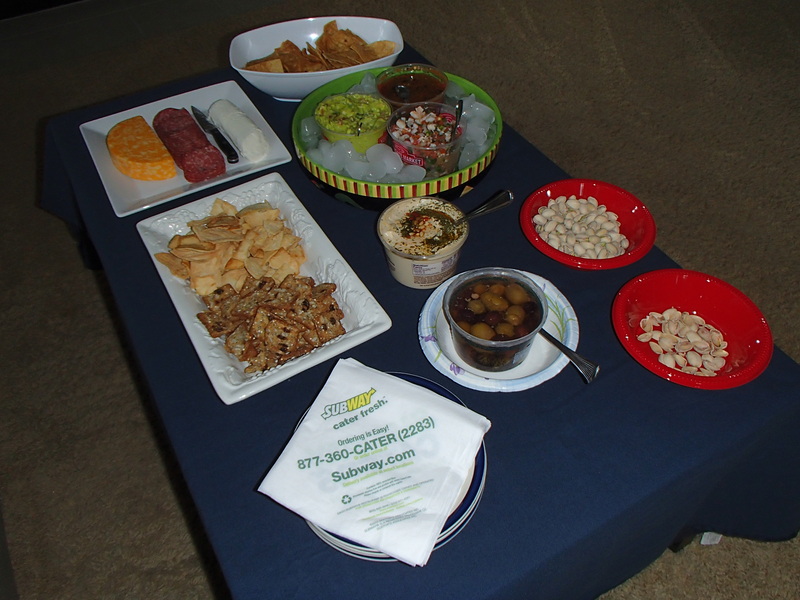 Lonnie’s boyfriend John invited us over to watch the Super Bowl and he had the best spread! He picked up this incredible cerviche from a nearby restaurant and I couldn’t stop eating it. The guacamole and salsa were great too. They had a nice kick! He also had honey goat cheese, sharp cheddar, pepperoni, olives, hummus, and more. I was enjoying all of the fun finger foods America has to offer. Thanks John! You can’t get more American than Super Bowl Sunday. The match up between two brothers was exciting and the Ravens had been playing so well. I was definitely going for Baltimore. I think their story just connected with me more. When I was little, I could never sleep the night before our vacations! I would be so excited seeing all of our suitcases in the living room. I still remember seeing my Mom wrapping up last minute things in the middle of the night and me being bright-eyed and ready to jump in the van! Tonight is a little different. I am going to check-in to my flight and make sure I have everything I need for tomorrow before getting a good night’s rest. I can rest happy because the Ravens won and I will be heading on a jet plane tomorrow for down under! Living each day to the fullest in Australia!